I don’t read a whole lot of YA fiction these days (or ever, really). Even less middle school fiction. And I suppose Have Space Suit—Will Travel, like The Hobbit, would be marketed as middle school fiction were it to be released today. There isn’t a love story, and a book simply must have a love story—preferably a triangle—to be YA. But what it is is good—better than most and certainly different than anything I read. Like The Hobbit, it threatens to be a bit too twee at times, but I never found it overwhelming. 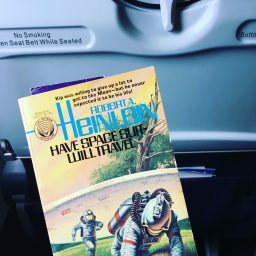 It is, like its protagonist, unabashedly earnest; entirely unapologetic in its love of science and engineering and work; and sharply written, showing full well Heinlein’s immense talent for aphorisms—if I hadn’t stopped writing down or tweeting every great line I would still be reading it. It also has two absolutely killer hard science fiction action sequences. “Certainly,” he answered and looked back at his book. It was Jerome K. Jerome’s Three Men in a Boat, which he must know by heart. Alright, let’s break it down. Our main character is a kid, he’s asking his dad for permission (His dad is there! And important!). He wants to go to the Moon but, it is implied, already has a space suit before he ever gets there. His dad reads, so he’s smart, and cool, but old, comical fiction, so he’s not a snoot. And, finally, the biggie. Clifford (Kip, to his friends) is on his own. These days they’d throw Kip’s dad under the jail for even suggesting such a thing. In a not terribly realistic but entirely unsurprising twist, Kip does end up on the Moon. But he’s got to put in a bit of elbow grease in the meantime. He only needs one of two things to get to space. Money or skills. Unfortunately, he has neither. Sure, he does well enough in school. Well enough to get into State Aggie, but did you know they’re flunking out 40 percent of the freshman class? (Those days are long gone.) And at his small town high school he’s stuck with a curriculum that, as his dad tactfully puts is, is “Twaddle! Beetle tracking! Occupational therapy for morons!” (Some things never change.) Which creates a bit of a conundrum. “The law declares that you must attend school until you are eighteen or have graduated from high school,” so no homeschool. (It wasn’t all daisies in the 50s, boys.) Kip could get shipped off to boarding school, but that gives you the wrong “nutty ideas about money and social position and the right tailor” when you could be picking up the right nutty ideas at home. So Kip’s dad is forced to direct him to the main method of learning—self-study. In what amounts to handing him a pile of books, suggesting that if he works very hard he might succeed, and leaving him to it. My dad would have found this a little overbearing but otherwise approved. Heinlein is 100% Pure-T unashamed to be writing a protagonist who is 100% Pure-T unashamed to want to go to space. In Kip’s (and Heinlein’s) estimation, about half the boys in school would admit to wanting to go to space, about half wouldn’t admit it, and the rest were creeps. Anyway, back to the elbow grease. Kip embarks on a Grade-A course of self-study. Not that either he or his dad are opposed to taking a short cut when the opportunity presents itself. So when a soap company offers a tourist trip to the Moon as a promotion, Kip jumps all over it. Selling soap, cutting a deal for the wrapper, and sending off tagline after tagline to up the odds. And…he wins! Well, sort of. It turns out that, while they picked one of his lines, someone else got the same line in first. So they get the trip and he gets a gently used space suit. The logical thing would be to sell and get a head start on financing college. Kip, on the other hand, sets about making it space ready. There may be a screwdriver involved. And it’s a beautiful thing to read. Kip and Heinlein both take great care in their craft. Heinlein writes about work as well as Melville or McCarthy, and with actual readable prose. I didn’t know or care anything about space suits before I picked up Have Space Suit—Will Travel. Heinlein made me care and then he let me know. Smart move by Kip. 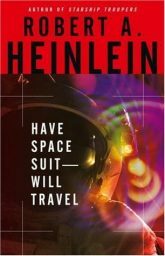 In Heinlein’s vision, keeping a perfect, working space suit ready will never go unpunished. Kip is taking a moon walk across the cow pasture when he has a close encounter of the extraterrestrial kind. So he winds up kidnapped, headed to the Moon with a precocious young girl who goes by Peewee (young, no love interest here), a lemur-like “Mother Thing,” a, uh, mantis-like villainous alien, and his two human confederates. And we’re off on our adventure. A few quick thoughts on the book as a whole: This is hard science fiction at its best. Not just the scenes of Kip working on the space suit. That comes in handy in two killer action scenes, in both of which his survival depends on the integrity of his suit. They work because Heinlein has established that he is deadly serious about the suit. The science works on behalf of the fiction. There is a shift in tone later on that is jarring, but in service of Heinlein trying to do something else entirely (I really wasn’t expecting him to go all Dark Forest there). The more political views of Heinlein’s mid-stage career are mostly absent, although one alien does describe democracy as “a very good system, for beginners.” The views that tend to shine through are less concerned with macro-systems than the social orders of little platoons. I don’t read a whole lot of modern YA, but I’ve read enough to find one thing about Have Space Suit—Will Travel remarkable: it’s almost entirely concerned with Kip’s relationships with adults. Even Peewee is several years younger. I don’t think he interacts in any serious way with anyone his age. For all of a little interstellar travel, what roots the events of the book as a success for Kip is standing up a bully. But it’s not a school bully, it’s a town bully, an adult. Kip’s natural mother is largely absent, but the “Mother Thing” plays that role when he is away from Earth. And, of course, as the above shows, his dad is an enormous early influence. Standing up to the bully puts a bow on it for even the least ambitious of youngsters, but the real prize at the end is that Kip is handing the opportunity for success because he has proven himself to the older men who serve as gatekeepers. Tune back in in two weeks, when I examine what happens when a modern writer tries to imitate the Heinlein juvenile! Jo Walton on Have Space Suit—Will Travel at Tor.com. James Nicoll on Have Space Suit—Will Travel at James Nicoll Reviews. 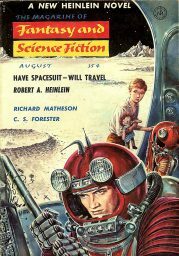 Throwback SF Thursday: Have Space Suit—Will Travel by Robert Heinlein was originally published at the Castalia House Blog. One Quiggle. Kip wants to shrug him off, but his boss at the drug store, Mr. Charlton, wonders “how harmless such people are? To what extent civilization is retarded by the laughing jackasses, the empty-minded belittlers?” Mr. Charlton would not have been a fan of Twitter. Quiggle, lacking a soda fountain, would presumably be an Internet troll. Or meth cook. Or both. This entry was posted in Book Reviews, Science Fiction, Throwback SF and tagged Hard SciFi, Vintage SF, Young Adult. Bookmark the permalink. Eagerly awaiting the modern comparison.